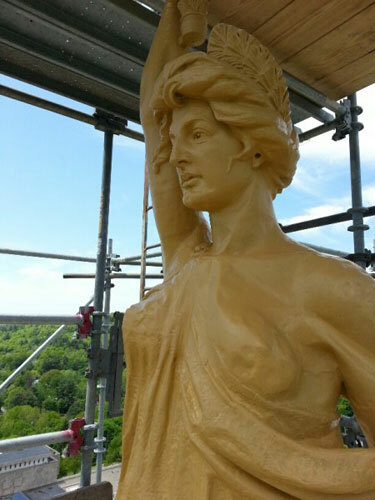 The statue of Minerva had suffered a lot of weather damage, and required re-gilding last year. Clara Mayerovich arrived in Boston in the Summer of 1905 to join her immigrant husband Samuel who was already resident in the United States, operating his own business as a metal fabricator and coach builder. Clara’s departure from Odessa was precipitated by the outbreak of Revolution and associated Jewish pogroms in that city. 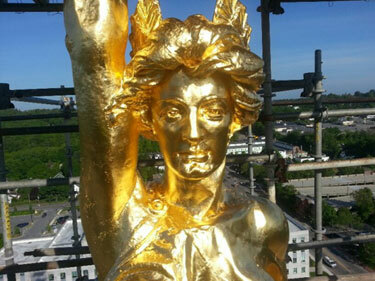 Within four years, Sam Mayerovich was working with sculptor William Clark Noble on a 15′(4.572 m.) statue of the Goddess Minerva for the dome of the newly remodeled Maine State House. Clara was the model. It’s difficult to contend that America does not have a tradition of offering unusual opportunities to immigrants. My wife Karen was looking at the old newspaper articles the other day, and wrote up the whole story. One Feedback on "My Wife’s Jewish Great-Grandmother Stands Atop the Maine State House"